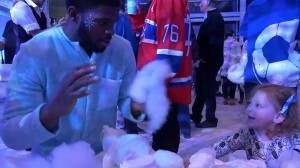 Montreal Canadiens defenseman and philanthropist PK Subban treated youngsters at the Children’s Hospital in Montreal to a holiday treat they will never forget. Partnering with the Air Canada Foundation, Subban, who has an atrium at the hospital named after him, transformed the space into a winter wonderland, filled with gifts, face-painting, magicians, cookies and candy. The biggest surprise was Subban walking from behind a curtain, dressed in a powder-blue “onesie” to join the children in the celebration. Subban didn’t forget about the families of the children, who received vouchers for Air Canada flights. The family of young Andy Corsino, a patient at the hospital, recently had lost their home in a fire, and received a check for $5,000 to help them get through the holidays. If your company is interested in booking PK Subban for a speaking engagement, corporate appearance or charity event, contact AthletePromotions or call 888.246.7141.